This book features case studies and reports on the use of “web 2.0″ and social networking applications and services to increase the impact of research on policy in Latin America. During 2010 and 2011 Fundación Comunica, with funding from the International Development Research Centre (IDRC, Canada) and assistance from the Association for Progressive Communications (APC), supported a series of small research projects examining the use of online social networking services to link research and policy in the region. Twelve projects were supported, most of them selected from ninety-seven proposals received following the distribution of a call for proposals in May 2010. Two types of projects were supported: (i) action research projects involved both implementing and evaluating a specific use of one or more online social networking services to link research and policy or researchers and policymakers, and (ii) more conventional ones evaluated existing initiatives implemented by third parties. Projects in which researchers made use of online campaigns to make their research conclusions more visible to the public at large, usually with the expectation that public support and visibility would give their proposals increased legitimacy and support among policymakers. Projects in which researchers sought to support online public consultation processes in collaboration with government entities. Projects which explored the use of web 2.0 and social networking services to open direct channels of communication between researchers, policymakers and other stakeholders in order to communicate research, collaborate on specific activities, and/or with a more-or-less explicit objective of getting them to know each other better and to build trust. 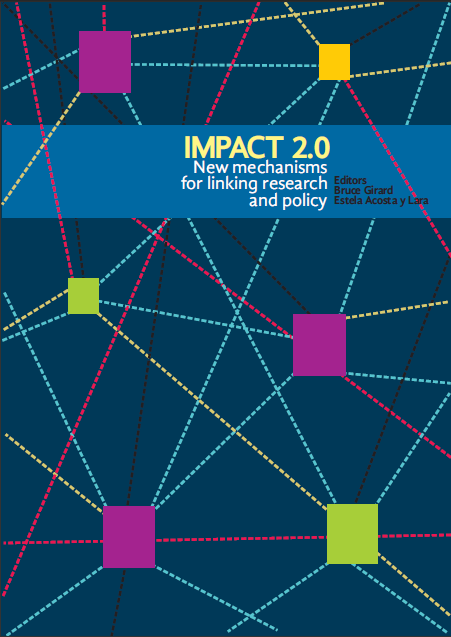 For the Impact 2.0 projects, the most successful uses of web 2.0 and online social networking to connect research and policy were those that involved the public in campaigns and consultations. Less successful were those projects that focused on the direct relationships between researchers, policymakers and other stakeholders. Edited by Bruce Girard and Estela Acosta y Lara, this book is a product of that research.